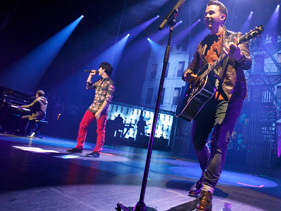 A Los Angeles woman filed suit on Monday in Los Angeles against the Jonas Brothers claiming that she was severely injured during a fan crush at a free show by the brotherly trio in May 2010. According to E! Online, Ashleigh Johnson claims that she was crushed against a security fence by excited fans at a free afternoon show by the group at Los Angeles' The Grove. The suit targeted the brothers' corporate organization, Jonas Brothers Enterprises, as well as Caruso Management Co., the company that runs the Grove. Johnson's suit claims negligence by the venue and the band, claiming that both knew that a large group of people would show up for the gig and that proper security measures were not taken to ensure safety at the outdoor shopping mall. She said she suffered "severe injury to her body and shock to her nervous system" after being crushed against the fence by excited fans, in addition to "great mental ... and nervous pain." A spokesperson for the group could not be reached for comment at press time. this year with an as-yet-untitled effort. They unveiled one new song expected to make the cut at a New York show in October, "Wedding Bells," and they told MTV News that the new disc will feature all original material performed and written by them.